This topic contains 27 replies, has 12 voices, and was last updated by Julie Niederkorn 1 year, 8 months ago. After reading through the topic threads contained in the Belgrade forum, please post a question or comment before the PaleoBlitz on March 18-20, 2016. Thanks! My finds are mostly along shark and fish fossils from Belgrade. I did find a nice hunk of fossilized wood that has beautiful sparkling crystals I was hoping to find a way to stabilize as it is flaking. I am very interested in seeing others finds as I have only been in twice. I am fascinated by the colors of some of my items. I didn’t know there was that span of time to collect. I have seen some, in social media posts, have collected echinoids. I have never found any of those. Can’t wait to get back to Belgrade and I’m very excited to meet you all and learn a lot!! I’m looking forward to the PaleoBlitz! Here is a photo of my Cow Shark teeth with other finds from Belgrade. I’m not a shark expert, but perhaps @rleder could weigh in? I’ve only been to Belgrade a few times, and only have found small shark teeth, I believe. I did find a horse tooth at Onslow Quarry a few years ago, but it is probably Pleistocene. I am very excited to learn more about the fossils, including mammals found at Belgrade this weekend. I really like this format for discussing fossils! While I am very interested in hunting at the Belgrade Quarry, I have not yet had the pleasure. I have however hunted mammal skeletons in the Brule and Chadron of Nebraska several times, I love the way they prep out! The thread is a great example of the power of the Internet. These forums present a unique venue for diverse and disparate thoughts to be shared and thus allow us all to grow in our collective wisdom. Oh look! 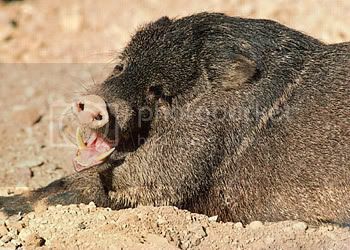 a picture of a Peccary! I have never hunted the Belgrade Quarry but find the items being found there quite interesting. They are of the same type of items that we are finding at various mines and quarries in central and south Florida. Looking forward to the chance to interact and meet with each of you. I’m looking forward to meeting you as well! I’m so excited to be a part of the PaleoBlitz! The Belgrade Quarry is a fantastic place to collect. I recently found my first Nebrius Thielenesis – Nurse Shark tooth and now I can’t help but to look for the tiny beautiful teeth. I have found 8 so far and one Squatina -Angel shark tooth. Looking forward to meeting everyone! Have not been to Belgrade. Looking forward to the event. Below I have posted my talk that I presented on Saturday about the Belgrade Paleoblitz. I hope that it is helpful to you in writing up club newsletter articles, and just generally as a reference point. I took a closer look at some of the teeth that I picked up in Possum Creek and found a pathological Sand Tiger tooth. Here is a quick snapshot, I will take a formal picture and post it on the MyFossil website. I thought Gordon Hubbles’ display of pathological teeth was really interesting. Hey Julie (@julie-niederkorn), this is a really nice finding and proof that pathological teeth are not that rare at all. Btw it might also be passible that we look at a pathological P. contortus tooth. I would really like to see some more pictures of it from different perspectives. Here are some different views of the tooth. Sorry for the poor photos from my cell phone. I do not have a formal set up yet. The last photo was taken with a $4 clip-on magnifier. The measurement in the photo is centimeters. Julie (@julie-niederkorn), Your Nurse shark is a great tooth. I just found my first one in Possum Creek during our field trip last week. I am very excited to have one in my collection now. I love your nurse shark!! That’s been on my list for a while! Hi Joyce, I just got back from vacation. No internet or cell for a week! You may be right about the tooth, thanks! I hope to get to Aurora in April, will you be there? I found this bone that someone else identified as possibly being a croc toe bone. Just curious for other opinions. It is broken at the end and is approximately 1″. Found in Belgrade this past Friday. @bmacfadden, @vperez, @rleder – what do you think?